It is impossible to travel in the Middle East without grasping the deep sense of agricultural history that permeates the landscape and the culture. The Middle East has been cultivating olive trees and producing olive oil for over 6,000 years. During a recent trip to Jordan, we were determined to turn back time and explore a region of the world whose identity is so closely linked to the venerable olive. History came to life through the eyes of an olive farmer named Fayez, and many olive oil-infused meals we had along the way. Dr. Mohammad Tarawneh, Professor of Archaeology at the Al-Hussein Bin Talal University and one of the guides on our trip to Jordan, told us that the earliest evidence of olive stones from settled sites in the Levant goes back to the Natufian period, more than 10,000 years ago. Some scholars believe the earliest evidence for the domestication of olives comes from the Chalcolithic Period archaeological site of Tleilat Ghassul in Jordan. According to the Jordan Times (02/17/2010), Jordan ranks 8th worldwide in the production of olives and olive oil, producing an annual average of 190,000 tons of olive oil from 15 million trees. Olive orchards produce the most important fruit in Jordan and are concentrated in two regions: the western mountain range that crosses the kingdom north-south produces 70% of the country’s output, while farms in the eastern and southern part of country produce 30%. The former is rain-fed, while the latter is irrigated. The predominant olive varieties are Nabali and Rasie, both indigenous, and Souri. The Jordanian Department of Statistics reported a total of 103 oil presses operation in 2009, 101 of which use advanced technologies. Jordan has an olive oil tasting team accredited by the Ministry of Agriculture in Jordan and the International Oil Council (IOOC). In Amman we met Fayez, a well-known calligraphist. At his home, we were served typical Arabic ("Turkish") coffee spiced with cardamom and introduced to his daughter who was giving a private English lesson to two students. We were also invited to visit to his family’s farm about 50km north of Amman, in the foothills of the Zarqa River watershed. Fayez told us he had bought the land in 1967 when he emigrated from Palestine. 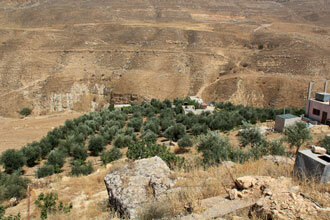 In 1998, he planted about 140 olive trees on the hillside. He chose the native varietal Nabali because it produces a popular oil with a light to medium fruitiness and delicious cured olives. The orchard is on the hillside and benefits from river water pumped from the river below all year long. In the summer, holes are dug upslope from the trees and soaked with river water. The earth is tilled by mule and plow and weeding is done with a fass, a kind of hoe/pick. No chemical fertilizers are used in the orchard, but pesticide against the olive fly is applied. Harvesting is a family affair in mid-November, before the rains come. The ripeness of the olives is surveyed carefully and the olives are picked by hand, straight off the tree. The freshly-picked olives are loaded directly into a truck and driven to the mill; one of the family members has to stay up all night in the line of trucks waiting for the mill to open after fajr (dawn) prayer. Fayez, like most Jordanian farmers, does not mix his olives with others; it is important to him to make his own olive oil. Fayez and his family make 20-40 tanakat (1 tonikah =16 liter tin container) of olive oil per year, enough for the entire family and clients who pre-order before the beginning of the season, earning about $7,000 (USD) in olive oil sales. Like most Jordanian olive oil, production is stored and sold in 16 liter (4.3 gallon) tin containers. To make cured olives, they crack green olives before soaking them in brine. Fayed assured us that it is a lot of work to score each olive, but he explained that doing so removes the bitterness and results in a rich, buttery taste. Another method is to remove the pit and stuff each olive with a mixture of walnuts and red spices before curing them in brine. We were very happy to have visited this family’s farm and enjoyed lunch with them. Most Jordanian olive mills produce olive cake pellets called jift which are made from waste and used for heating and cooking fuel. Jift burns for 7-10 hours! In nearby Anjara, there are ancient olive orchards that were planted by the Romans. The trees are considered a national treasure and known to have a high resistance to pests and diseases and produce a very high quality of oil. Locals take great care of these trees and are concerned about their extinction. Our trip to Jordan was organized by the luxury eco-tourism and adventure travel group, Mishwar Jordan, with the participation of Jordanian and American historians, archeologists, and botanists. 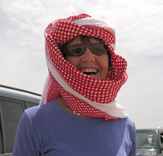 Our tour included camping, amazing meals, hiking, cameling, and horseback riding in the wilderness (black-, white-, and rose-colored deserts); visiting Amman, Jerash, Wadi Rum, and Petra; and meeting Jordanians in different walks of life. Mishwar Jordan uses only jift firewood as a sustainable alternative to protect Jordan's forests. Musakhkhan (pronounced m-SAKH-khn) is eaten throughout the bilad ash-sham – Syria, Lebanon, Palestine and Jordan – to celebrate the end of the olive-picking season. When the new oil arrives from the press, this meal is enjoyed on a big platter with all hands sitting around it and eating from the same dish. It is not intended to be light – it is a celebration of the production of another year's oil! Combine the sumac, spices, and salt. Set aside 2 T and mix the rest with the lemon juice and ¼ cup olive oil. Rinse the chicken and pat dry. Rub the spice mix into the chicken let it sit for several hours – up to a day. Toast the nuts and set aside (toast lightly, because they will go back into the oven later). Slice the onions and toss them with enough olive oil to coat them. Coat the bottom of a skillet with a thin layer of chicken stock and place the onions in the skillet. Sprinkle the reserved spices over the top. Fry the onions over low medium heat until they are nearly caramelized, but not burnt. Add a little more stock in the process if necessary. Preheat oven to 400F / 210C. Grease a baking sheet with olive oil and put the chicken skin-side down on the baking sheet. Cover with the onion mixture and cover all with foil and bake for 20 minutes. Remove from oven. On a round metal or ceramic (i.e., ovenproof) serving dish drizzle olive oil and arrange the bread to cover the pan. Drizzle olive oil over the top of the bread, and place in the oven until it starts to get crisp (a few minutes). Remove from the oven, remove foil, and brush the bread lightly with chicken stock. Place the chicken now skin-side UP on the bread, and surround/ sprinkle with onions. Sprinkle more olive oil over the top. Sprinkle sumaq over it all, if desired. Bake for 15 minutes, then sprinkle it all with the toasted nuts and return to the oven until the chicken-skin is crispy brown (5-10 minutes). Serve on individual plates, and slice the onion-covered bread with a pizza-slicer as a side dish, or use the bread to eat from the same platter. Put small dishes of cold yogurt (garnished with sumaq if desired) around the platter, and several bowls of oil in which to dip the hot bread.